BLIND CONTOURS! This is one of my favorite exercises I do with Claire, my art student. We both find it a challenging task, but also a great way to warm up before a long session of artin'. For art lessons, we usually start with our blue mechanical pencil and a sketchbook page. The subject for the day can be anything from a pinecone to a pet dog. In these photos, we were at the Field Museum of Chicago and drawing a statuette from the Egyptian exhibit. To start with I recommend timing yourself or your student. Conveniently, my smartphone has a timer app but a watch would work just as well. Generally the first few sketches are around 30 seconds to a minute, and the final might be closer to two or three minutes. 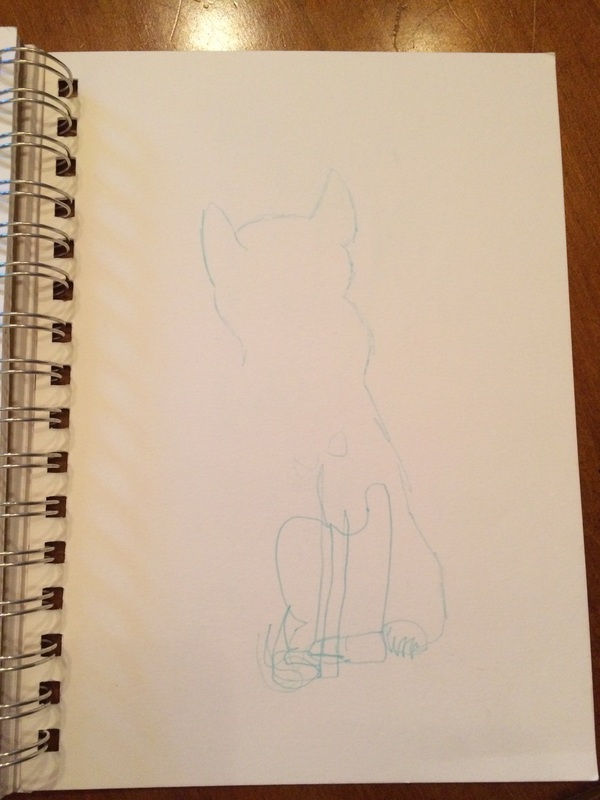 Claire's blind contour of the Bastet statue in 45 seconds. Now that Claire is familiar with the drill I usually ask her how long she wants to go for and how many she'd like to do. I give her a reminder at the 1/2 time mark so she can keep track of time but other than that, it's all on her. Blind contours are an awesome way to get a feel for your subject before you start drawing without the pressure on yourself to make a "finished" piece of art. They're also challenging without requiring a huge time input, which is something I love as a teaching tool! Her finished Bastet sketch. She has plans to stipple this with pen and ink later, so we also took reference images for her to work from. What are your favorite warm-up activities before you start drawing or painting? I'd love to hear some of your answers and get ideas for teaching!